About 5,000 persons displaced in the deadly mudslides and floods that hit Sierra Leone on August 14 will be given temporary shelter in 48 hours, Ismael Tarawallie, the head of the Office of National Security said on Tuesday. So far, 499 bodies have been unearthed. More than 600 people remain missing. Those who know the affected communities estimate that the real number of victims could be well over 1,000. 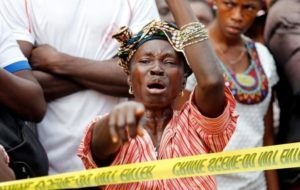 The government of the impoverished West African nation started receiving relief assistance after President Ernest Bai Koroma made a desperate call for help to support the thousands of people affected by the devastating mudslide. The aid consists of 60 tons of food, tents, blankets, and anti-cholera kits, the Moroccan foreign ministry said in a statement. Togolese President, Faure Gnassingbe and Chairperson of the Economic Community of West African States (ECOWAS) donated $500,000 to President Koroma during his visit to the country last week. Senegal has donated $100,000. The biggest donor in terms of cash has been China, offering a million dollars for disaster relief, including aid workers to offer medical help to injured victims. The West Africa Health Organization, WAHO, the Health Institution of the regional bloc ECOWAS, is donating a sum of $300,000 to the government of Sierra Leone. Other African countries have been sending relief items to the struggling nation. Posted by Khalid Al Mouahidi on August 23, 2017. Filed under News. You can follow any responses to this entry through the RSS 2.0. You can skip to the end and leave a response. Pinging is currently not allowed.